We are expecting people from as north as UC Davis to as south as UC San Diego flying into the bay area to attend this event. Within the first day of the Chi Alpha announcement, 110 tickets were already reserved out of the ~600 seats available. We mentioned this at the end of last quarter, but now we’ve got some details for you. 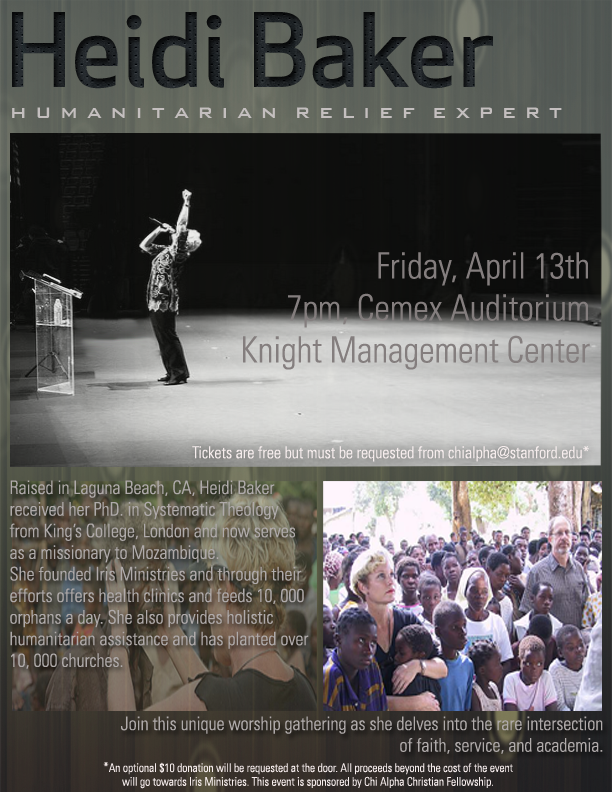 We will be hosting Heidi Baker at 7pm next Friday (April 13th) in Cemex Auditorium. So if you want me to hold a ticket for you, reply and let me know. Also feel free to have me hold tickets for friends you want to bring. This will not be a lecture – we will worship and then Heidi will share. Your non-Christian friends are more than welcome – just be sure that they know what to expect. P.S. Although the tickets are free, we will ask for a voluntary, pressure-free $10 donation at the door – all proceeds beyond our expenses will go to Iris Ministries. Please email chialpha@stanford.edu to reserve tickets. Previous Post Who is Heidi Baker?